AUDUSD is facing the resistance of the bearish trend line on the 4-hour chart. 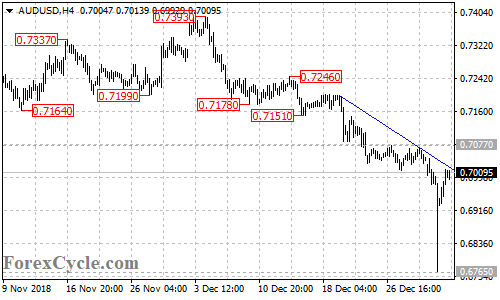 A break of the trend line resistance would confirm that the downside movement from 0.7393 had completed at 0.6765 already, then next target would be at 0.7100 area. Near term support is at 0.6970, below this level could bring the price back towards 0.6800.